Nice Price Or Crack Pipe: $45,000 For A 1970 AMC AMX? 78% of our readers say that $8,500 is too much for a 1991 Olds Quad 442, but what happens when we look at a no-joke classic machine from the Golden Age Of The Musclecar? 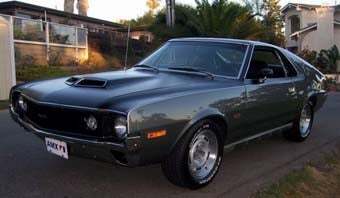 Even non-AMC freaks appreciate the original AMX (reviews are much more mixed for the Malaise AMX), but the days of snapping one up for cheap are decades in the past. You want a really nice two-seater AMX, you must pay. But must you pay $45,000? That's what we're dealing with here. The car looks great: original California car, stripped and repainted, all the original accessories down to the canned spare-tire air, etc… but it's not a 4-speed and that price is a real jolt. What do you think? Project Car Hell, Malaise Special Editions: Hang 10 Dart or Levi&apos;s Edition AMX? 45 grand for a 1970 AMX?